The terms tennis and golf elbow are named because of the high probability of their occurrence that players of the respective sports face. The predicaments of Tennis Elbow and Golfer’s Elbow are usually found among older people as their tendons lose their elasticity, the latter being more prominent with men. One of the alternative methods that is increasingly becoming mainstream for treating golf and tennis elbow in the USA is acupuncture. Also known as the Lateral Epicondylitis or Tendonitis, the condition is caused by the repeated strain and inevitable damage of the tendons and muscles on the outer side of the elbow. The resulting inflammation can be developed through activities that call for repetitive arm movement involving twisting and gripping. A single injury, medical ailments like arthritis, neck problems can trigger a tennis elbow in an individual. In spite of the natural healing, with unhindered movement, the stress tears the muscles at the top of the forearm. Its symptoms include twinges when the person grasps or lifts objects. With passage of time, the pain spreads out to other parts of the arm. When the pain associated is experienced as affecting the inside of the elbow, spreading out in a downward direction along the underside of the forearm to the wrist, the patient can be said to be suffering from Golfer’s Elbow. They, too, have to endure tightness in their forearms, pain and stiffness at the elbow, difficulty in cocking the wrist back or pinching, gripping, or lifting objects, reduced elbow movement, a weakness in the wrist of that arm. Tenderness on the medial side of the elbow is one factor that differentiates a golfer’s elbow from the tennis elbow. The theory behind this therapy is that the practitioner needs to explore and find out the points in the series of pathways where the natural energy flow has been blocked. To get rid of the pain means to get rid of the pressure that has been accumulated at these points. This is achieved with the insertion of thin, pre-sterilized needles at those particular points, stimulating them manually or by means of electricity or heat for the body to begin its healing process. Accelerating emotional and physical well-being, certain points influence the parts of the brain known to be sensitive to stress and pain. The release of endorphins and adenosine also helps control pain. Cupping, therapeutic exercises, and Chinese herbs may also used for the sake of minimizing the inflammation and overcoming muscle stiffness and mobility issues in the joint. Often, people begin with two sessions a week until improvement is observed or reported. The frequency is decreased over time, with improvement. The procedure is healthy, safe, and the healing long lasting. When compared to the western medicines, there may be a marked and significant improvement in just a few sessions of acupuncture. The patient may even be completely eradicated of the chronic pain as a result of acupuncture. The long story short is that acupuncture is extremely effective for these two conditions. 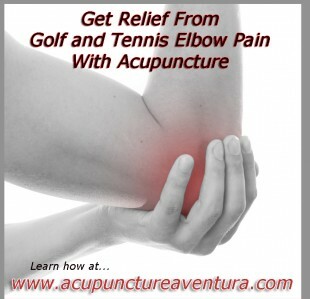 Do you have any questions about golf or tennis elbow pain and acupuncture? Let us help you get our of pain today! Call us at 786-537-7022 to learn more or schedule your first session.